SCT Systems Co.,Ltd. provides product and service to the market for many years. 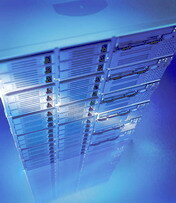 All major brands of PC & PC Server like IBM and Hewlett Packard are our strong recommend products to the customers. Even in higher performance PC Server like multi-CPU systems, SCT Systems can design and provide to the customer with a strong technical team. We offer a high quality PC hardware and Peripherals from the leading brands of the world. A reliable and high quality products will be integrated in to a robust system and ready all the time for business operation. In dynamic environment and technology changes, our customers want to deploy the best and suitable solution for its information technology system. We also deliver the best in class product for all Local Area Network (LAN), Wireless Network(Wi-Fi) as well as Wide Area Network (WAN). Our technical supporting team will assist the customers and partners to plan, design, install and implement the system to meet their requirements with maximized budget. Please Call us for more information or customize your facility requirement today.